It's a shame people are so opposed to change. Most of trigonometry would be a whole lot easier to understand if we didn't use Pi. So for all of you members of the Wheaton College community, and for anyone who might be visiting campus, I have a gift. 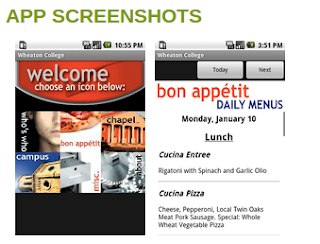 The (Unofficial) Wheaton College Android App. Student made by yours truly, Andrew Wolfe, and Alisa Maas, this application for Android phones features several useful tools for students, faculty, staff, and those visiting campus for the first time. You can browse the college's intranet (provided you're on campus wifi!) including the popular "Who's Who" area. Daily dining hall menu's are also available for viewing, so students can easily decide whether or not they will make the trek out of their room for a meal. Similarly, students can view the semester's chapel schedule to see upcoming speakers. A useful feature for visitors unfamiliar with the campus is a interactive map showing the locations of every building and including easy check ins with Foursquare and the ability to see who else is currently checked in at that location. Rounding out the feature list is a collection of links to those obscure pages on the college website that you frequently need but can never quite figure out where they are. An upcoming revision to the app will let you add and remove your own links to create your own custom list of shortcuts. So the point here is basically that all of you with Android phones out there should head over to the Android Market and download the Wheaton College Android App. Enjoy!